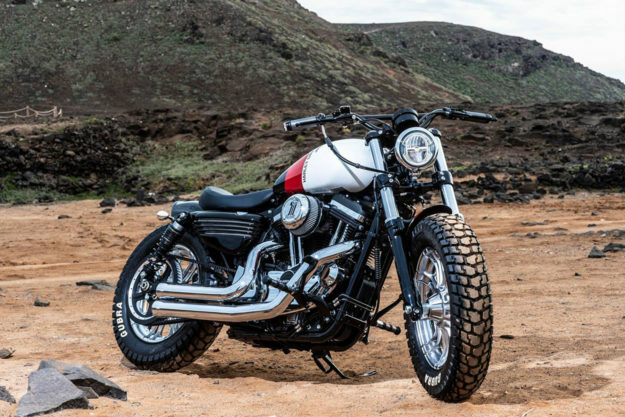 Battle Of The Kings 2019 Harley-Davidson’s dealer competition is back for 2019, and there’s a noticeable jump in quality this year—for both the bikes themselves and the standard of photography. 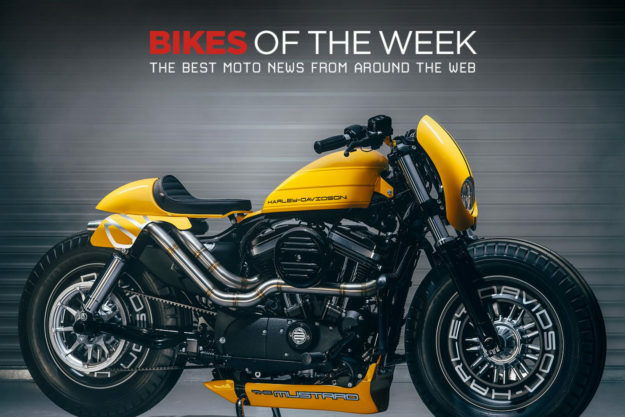 We’re seeing a few likely trophy contenders already, especially a pair of Sportster Forty-Eights: the yellow ‘Mustard’ from Shaw of the UK [top] and the ‘Mojo Desert’ from H-D Las Palmas in Spain [above]. Then there’s a Softail Heritage Classic from H-D Bologna called ‘Space Age’ [above], which celebrates the 50th anniversary of the Apollo 11 space mission. 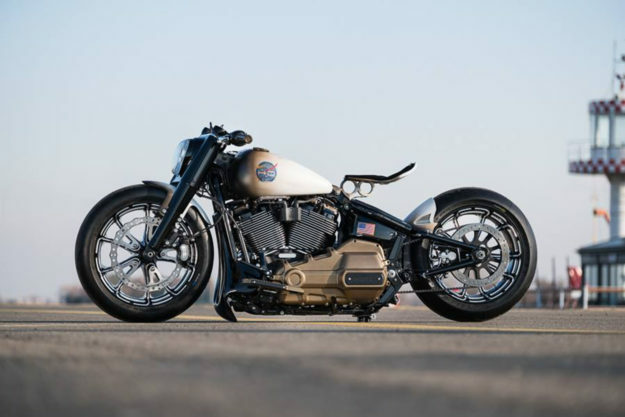 Over 200 H-D dealers from more than 30 countries have been working on their custom creations, and the European stage of the competition is now open. There are three categories—Dirt, Chop and Race—and if you’re in Europe, you can vote for your favorite here. Kawasaki Z1000 by Cowboy’s Chopper When he started out, Alex Gao of Cowboy’s Choppers specialized in one style of bike build—choppers, as you can probably guess. 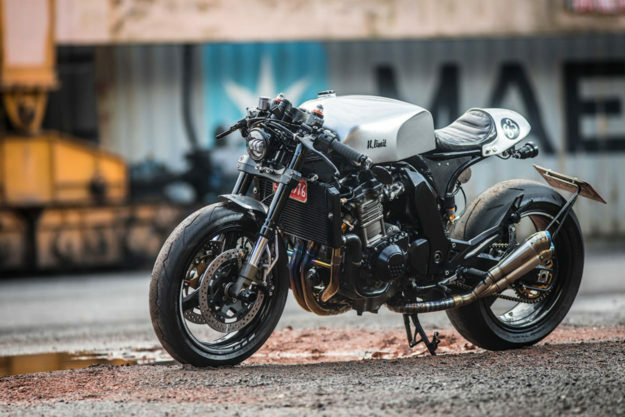 But these days he builds customs in any style, and the latest machine to roll out of his Taipei workshop is this brutal Kawasaki Z1000 cafe racer. Alex’s customer wanted a machine that would be at home on Taiwan’s twisty mountain roads. So Alex took a 2003-spec Z1000 as his starting point. 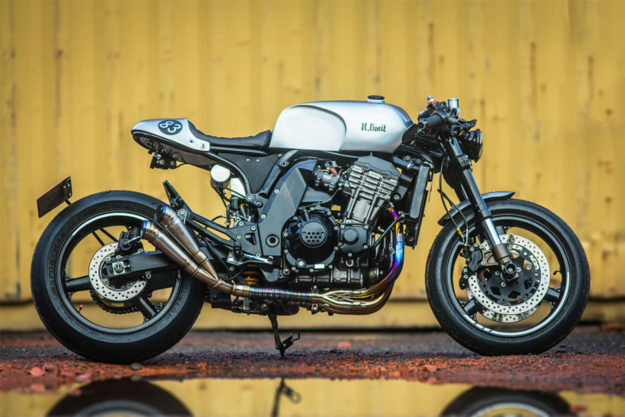 “The goal was to inject a dose of retro-flavour into an otherwise run-of-the-mill naked street bike,” he says. 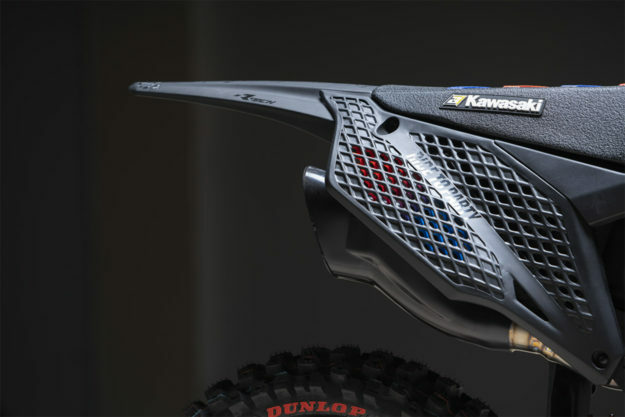 Kawasaki KX450 by Alvaro Dal Farra Battery packs aren’t the only revolution happening in the moto world today. 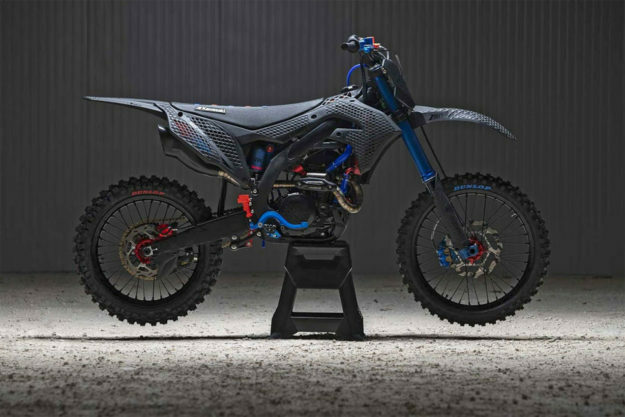 3D printing is picking up speed within the custom scene, and offers some amazing opportunities—just check the bodywork on this KX450 from Italy. 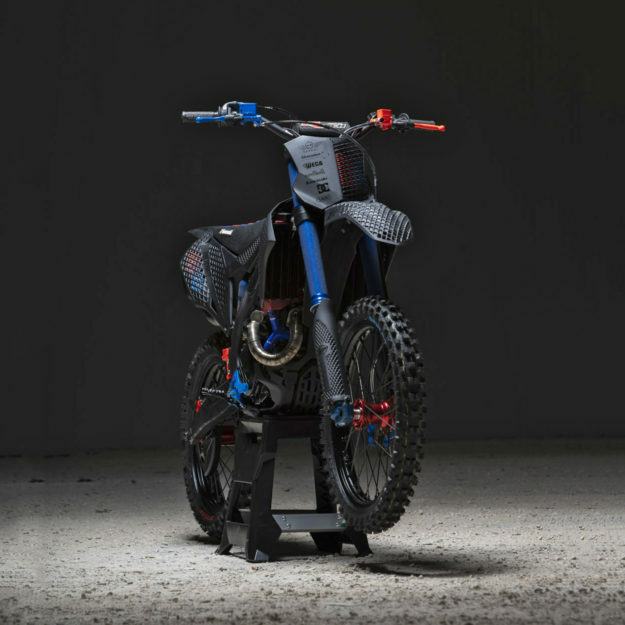 It belongs to Alvaro Dal Farra, a freestyle MX rider and trainer from Italy. Alvaro commissioned the designers at Codoro Studio to come up with a futuristic revamp with the same colors as the first ever bike he lusted after, a 1980s Malaguti Grizzly. Since Alvaro runs an FMX training school, he’s upgraded most of the hard parts on the KX, with a new brake system, a Zard exhaust, new engine internals from Athena/Get and new Kite wheels. 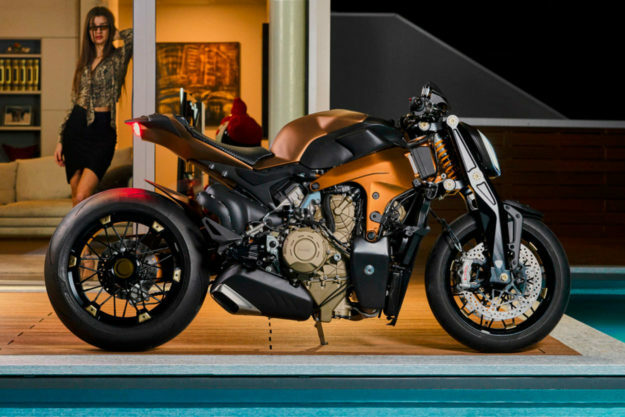 Ducati Panigale by Officine GP Design Word on the street is that Ducati will reveal a new Streetfighter V4 model at EICMA in November—but you can guarantee that it’ll look nothing like this. 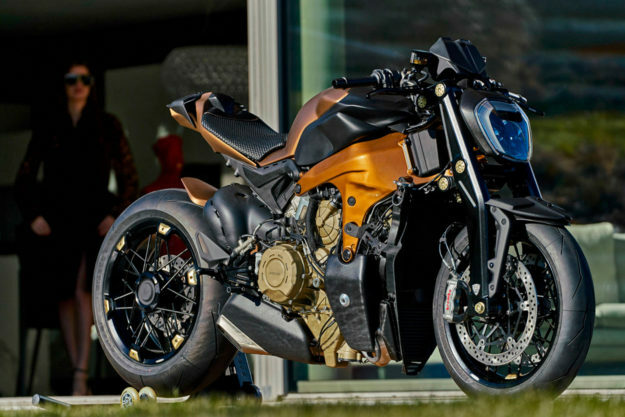 Officine GP Design have taken a Panigale, stripped off the bodywork, added a girder fork from FG Racing, XDiavel lighting, a new tank cover, and very chunky spoked alloy wheels from Jonich. 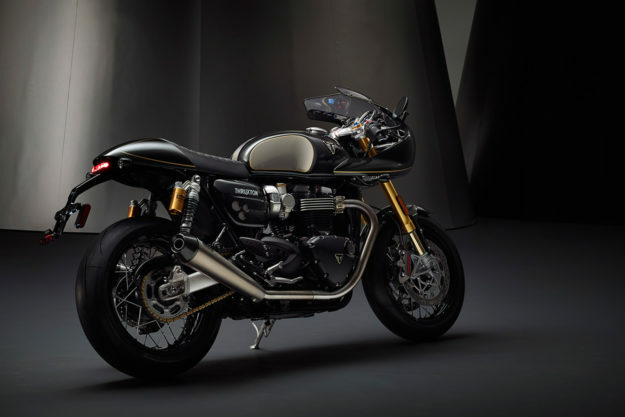 Triumph Factory Customs Triumph’s relentless release schedule shows no sign of abating. 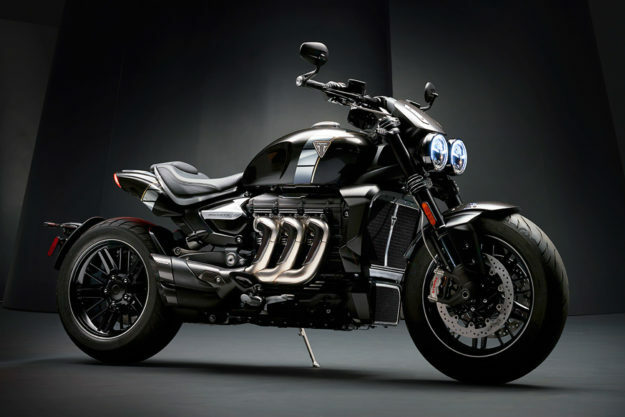 Even as the engines were cooling down at the Speed Twin launch, the Hinckley crew revealed two ultra-premium limited editions of current models, called TFC. 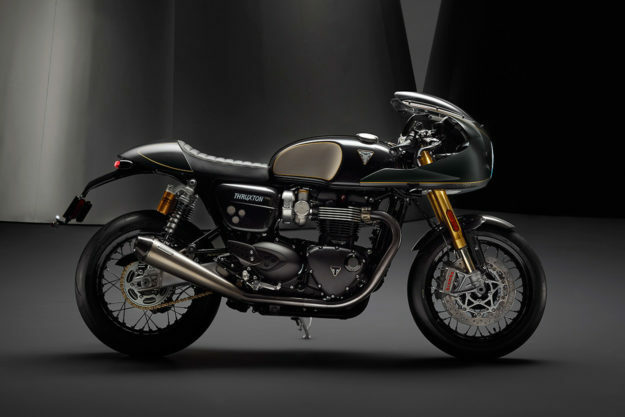 There’s a Thruxton TFC [above] with more power, less weight and a higher specification than the Thruxton R. Just 750 of these carbon-fiber-bodied machines will be built. Then there’s a ‘concept’ Rocket TFC [below] that hints at a return of the famous name to showrooms. The Thruxton TFC gets a power boost to around 105 hp, and a small torque increase too. Weight is down a useful five kilos, helped by Vance & Hines titanium silencers. The suspension is top-spec, fully adjustable Öhlins all round.